CHJA PRE CHILDREN'S MEDAL Rider to be a Junior member of the CHJA who has not shown over fences exceeding 2'6” at a recognized horse show. If a rider has ever qualified for or shown in a 2’6” Equitation final including the CHJA Children’s Medal, they are no longer eligible for the Pre Children’s Medal. The class consists of two phases. The first phase is over a course of not less than eight obstacles at 2'0" in height, which must contain two changes of direction after the first fence with no combinations permitted. Judges will select twelve contestants (if available) to show at a walk, trot, and canter. The second (flat) phase is mandatory and will count 50%. Riders may show horses or ponies. The same horse/pony to be shown by the same rider in both phases. To fill the class at least four competitors must complete both phases of the class. Judges may require additional testing, using current US EQUESTRIAN Tests 1-8. 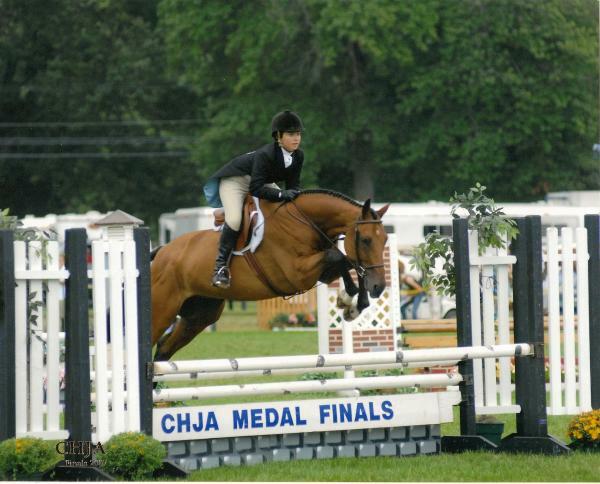 CHJA CHILDREN'S MEDAL: Rider to be a Junior Member of CHJA who is eligible for Children's Hunter, and has not shown over a course where fences exceeded 3' at a Recognized show. If rider has ever qualified or shown in a 3' Equitation final inclucing CHJA, they are no longer eligible for the Children's Medal. The class consists of two phases. The first phase is over a course of not less than eight obstacles at 2'6" in height, which must contain two changes of direction after the first fence with no combinations permitted. Judges will select 12 contestants (if available) to show at a walk, trot, and canter. The second (flat) phase is mandatory and will count 50%. The same horse to be shown by the same rider in both phases. Judges may require additional testing, using current US EQUESTRIAN Tests 1-8.
urse of not less than six obstacles. Small ponies to jump obstacles 2'0" in height, Medium ponies to jump obstacles 2'3" in height, and Large ponies to jump obstacles 2'9" in height. If a combination is used, suggested distances for in and outs are 20' for small, 22' for medium, and 24' for large ponies. If the distance between obstacles is less than 72' then the distance must be adjusted for each height section. Judges will select 12 contestants (if available) to show at a walk, trot, and canter. The second (flat) phase is mandatory and will count 50%. The same pony to be shown by the same rider in both phases. Judges may require additional testing, using current US EQUESTRIAN Tests 1-8. CHJA JUNIOR MEDAL: Rider to be a Junior Member of CHJA who has not reached his/her 18th birthday. The class consists of two phases. The first phase is shown over a course of not less than eight obstacles 3'0" in height, which must include one combination including an oxer, and two changes of direction (change of lead) after the first fence. Judges will select 12 contestants (if available) to show at a walk, trot, and canter. The second (flat) phase is mandatory and will count 50%. The same horse to be shown by the same rider in both phases. Judges may require additional testing, using current US EQUESTRIAN Tests 1-19. Note: A rider qualifying for the CHJA Junior Medal Final may choose to ride in either the Junior Medal Final or the Master's Medal Final. If a rider has ever qualified for any 3'6" (or higher) final prior to the end of the qualifying period for the current year's Medal Finals, (e.g., Medal/Maclay/Washington/USEF) they must ride in the Masters Medal Final. 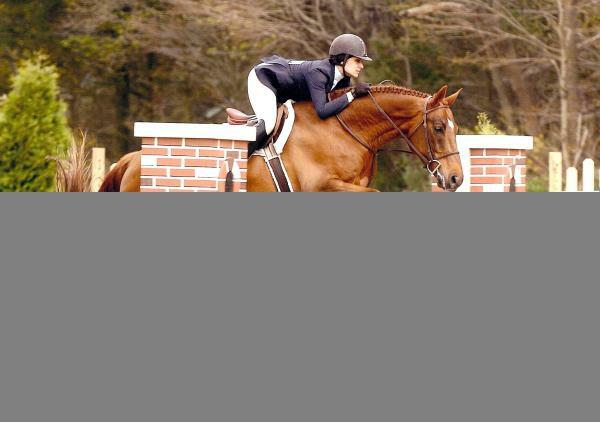 Rider to be an Amateur Adult Member of the CHJA who is eligible for Modified Adult Equitation. The class consists of two phases. The first phase is shown over a course of not less than eight obstacles 2’6”' in height, which must include one combination and two changes of direction after the first fence. Judges will select 12 contestants (if available) to show at a walk, trot, and canter. The second (flat) phase is mandatory and will count 50%. The same horse to be shown by the same rider in both phases. Judges may require additional testing, using current US EQUESTRIAN Tests 1-19. CHJA ADULT MEDAL: Rider to be an Amateur Adult Member of the CHJA. The class consists of two phases. The first phase is shown over a course of not less than eight obstacles 3' in height, which must include one combination including an oxer, and two changes of direction (change of lead) after the first fence. Judges will select 12 contestants (if available) to show at a walk, trot, and canter. The second (flat) phase is mandatory and will count 50%. The same horse to be shown by the same rider in both phases. Judges may require additional testing, using current US EQUESTRIAN Tests 1-19.
alified in the current year for the CHJA Adult Medal Final or the CHJA Junior Medal Final. The class consists of two phases. The first phase is shown over a course of not less than eight obstacles 3'3" to 3'6" in height, which must include one combination including an oxer, and two changes of direction (change of lead) after the first fence. Judges will select 12 contestants (if available) to show at a walk, trot, and canter. The second (flat) phase is mandatory and will count 50%. The same horse to be shown by the same rider in both phases. 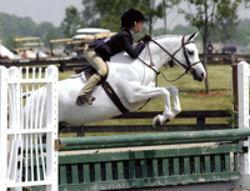 Judges may require additional testing, using current US EQUESTRIAN Tests 1-19. A rider qualifying for the CHJA Adult Medal Final may choose to ride in either the Adult Medal Final or the Master's Medal Final. A rider qualifying for the CHJA Junior Medal Final may choose to ride in either the Junior Medal Final or the Master's Medal Final, with the exception that a rider who has qualified for any 3'6' (or higher) final prior to the end of the qualifying period for the current year's Medal finals, (e.g., Medal/Maclay/Washington/USET) must ride in the Master's Medal. The Master's Medal Final will also be open to all past CHJA Medal Finals Champions and Reserves, with the restriction that they be current juniors or amateurs. To be judged on performance and soundness, suitability and manners to count. To be scored under the open numerical judging system using two judges. Each competitor will jump one round of approximately 10 fences. The ten horses with the highest scores from the first round will return to jump a second round over a different course. In the event of equality affecting the selection of the top twelve, all those equal will qualify. The scores of the horses in the second round will be added to the first round scores and placed in order of their total score for the two rounds. Horses tied for first place only will jump a third round over a shortened course. Ties for all other places will remain tied. To be shown over a course of approximately 10 jumps not to exceed 3' in height with spreads to 3'. To be judged on performance and soundness, suitability and manners to count. To be scored under the open numerical judging system using two judges. Each competitor will jump one round of approximately 10 fences. The ten ponies with the highest scores from the first round will return to jump a second round ov er a different course. In the event of equality affecting the selection of the top twelve, all those equal will qualify. The scores of the ponies in the second round will be added to the first round scores and placed in order of their total score for the two rounds. Ponies tied for first place only will jump a third round over a shortened course. Ties for all other places will remain tied. To be shown over a course of approximately 10 jumps. Small/medium ponies to jump 2', and large ponies to jump 2'6' with spreads to 2'6". Open to teams of one Professional and one Junior or Amateur rider from the same barn. First Round: This will be the score earned by the Junior or Amateur member of the team in the first round of the Pony, Horse or Adult Hunter Classic held just before the Trainer’s Team Hunter Classic. Second Round: The Professional will complete a traditional Hunter course of approximately 10 fences not to exceed 3’ with two high-option fences for each fence height not to exceed 3’6”. To be judged on performance, soundness, hunter pace, jumping style, quality and substance. Suitability and manners to count. To be scored under the open numerical judging system using two judges. In each Professional round, after the judges' base score is given, one point will be added for each high-option fence jumped up to a maximum of two. The scores of the horses in this second round will be added to the first round scores obtained by his Junior or Amateur teammate and the teams will be placed in order of their total score for the two rounds. Horses tied for first place only will jump a third round over a shortened course. Ties for all other places will remain tied. Small/medium ponies to jump 2’, and large ponies to jump 2’6” with spreads to 2’6”. Horse fence height not to exceed 3' with spreads to 3’. Two high-option fences to be set for each fence height not to exceed 3’6” Horses to jump first. Judges may require additional testing.